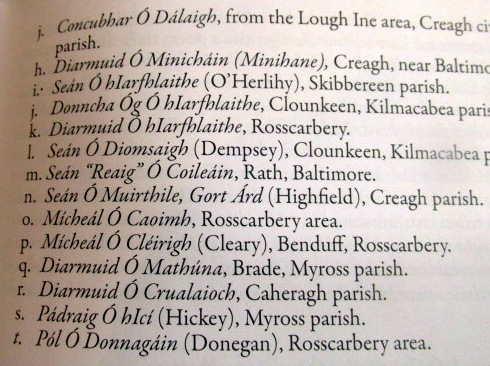 Old Caheragh Church and Caheragh Poets in Irish, Na Baróidigh, (Seán, Seámus, Riocárd) Lissane, Donnacha, Muiris and Paul Ó h-Anngáin, Donnacha Ó Briain, Diarmuid Ó Crualaoich, Catholic Church Bell Provided by Patrick Rocky Mountain O’Brien of Dromore. 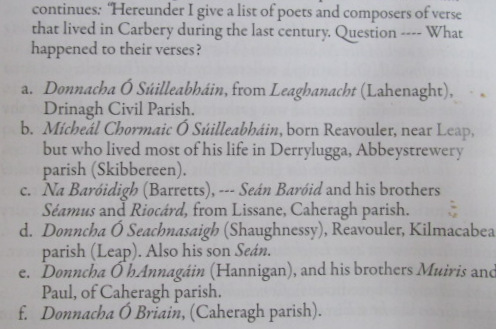 Old Caheragh Church and Caheragh Poets in Irish, Na Baróidigh, (Seán, Seámus, Riocárd) Lissane, Donnacha, Muiris and Paul Ó h-Anngáin, Donnacha Ó Briain, Diarmuid Ó Crualaoich, Mícheál Óg Ó Longáin (lived later Glanmire), Church Bell Provided by Patrick Rocky Mountain O’Brien of Dromore. Thanks to Peter O’Driscoll, Aughaville now San Francisco. The old church was built by Fr. Dore, one of a number of Tipperary Priests seconded to the Dioceses of Cork. Father Dore appears as an elector for O’Connell/Roche in the 1841 election. It is believed that the church was built with stones from Ballyourane Castle formerly a McCarthy castle. The Priests were dynamic school and church builders, introduced Parish Registers and were highly active politically. Included were Father Quin in Durrus, Father Ryan Drimoleague and Father Doheney in Dunmanway. Old Caheragh Parish Church, the church was built by Rev. David Dore about 1823, There are are four or five priest buried in the grounds Rev, Dore, Rev Palmer, Rev Wall, Rev Stack & Rev Hayes. Two outside on the grounds and three inside under the church floor. The arch over the front gate with the bell tower was donated by a Patrick O’Brien who was related by marriage to the O’Driscoll of Coolbawn. He is better known as Patrick Rocky Mountain O’Brien. He did write a book still available, Title Birth and Adoption: A book of Prose and Poetry. Patrick Rock Mountain O’Brien was involved in the Fenian Movement in New York where he died about 1925. He was born in the townland of Dromore and one of the few people to board a ship bound for America at Bantry Bay. He would be a relative of the O’Brien family in Dromore. The grounds where the church was built was part of Nick Keohan (Keohane) farm also the new graveyard. In the 1960s after the new parish church was built the parish then purchased land for the new graveyard attached to the east side of the old church grounds. During the purchase they had the area mapped. nearby was part of a Goggin family farm and the old Murphy home. The original Murphy home was on no-mans land a rocky place by the side of the road. (Better known as a home built by a family that had been evicted by a landlord a family that found shelter by the side of the road) . When you entered the gate to the church grounds on your right stood the old parish hall and attached to the hall was Danny & Nell O’Neil’s home. Just a few feet away was Jerry & Mary Murphys home where they raised 12 children on Jer Murphys wages as a shoe (cobblers). On the stage in that Parish Hall in the winter of 1959 a play called the Damsel from Dublin was performed involving the match maker stage name was Brian Cleary that trick-ster.